Join us for the “sharpest” party of the year. The kitchen knife. We firmly believe your knife will be the most essential kitchen tool you ever purchase. And choosing the right knife for you is one of the most important things you can do for your cooking skills. So how do you know which is best for you? With the help of our skilled employees and the professionals from Wusthof- we will get you in “sharp” shape for kitchen success. Yes- a great knife is super-sharp—but when you know what you’re doing, you can be even sharper. Saturday April 27th we are taking the day to celebrate our love for the knife. Join us as we open our doors to a whole crew from Wusthof Knives- and we celebrate together with you. Wusthof has been creating knives in Solingen, Germany for over 200 years. We are proud to stock fine tools by Wusthof-Trident a company whose core values are passion, diligence, and perfection. Please join us for the Wusthof Block Party! You’ll enjoy the best deals of the season – and we are genuinely not kidding around – this ONE-DAY ONLY sale we can pass on savings more than we have ever taken off! 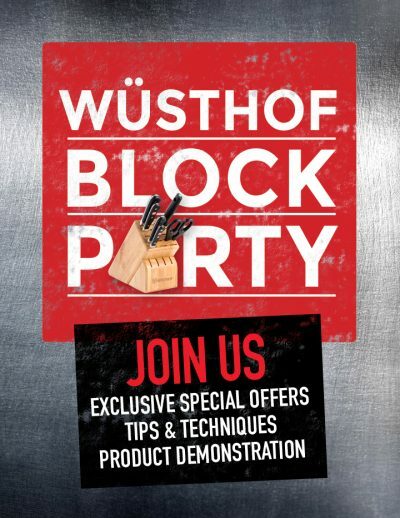 Our Wusthof knife experts will be here to talk all things knives, demonstrate techniques and skills, and teach proper care for cutlery. We will have knife sharpening, demo classes (that feature a free knife), try me stations, and the best chance to hold these amazing knives in your hand. 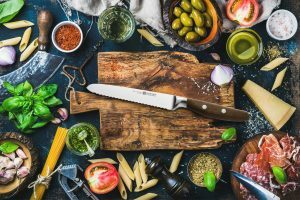 Wusthof Test Drive Stations– Ever wonder what chef knife fits best in your hand, or how that new bread slicer REALLY slices better? We will have several stations for you to come test drive some of our favorites knives- feel confident before your next knife purchase. SALES. SALES. SALES. We are so excited to offer the best pricing on knives we will offer all year! Get your wishlists ready! 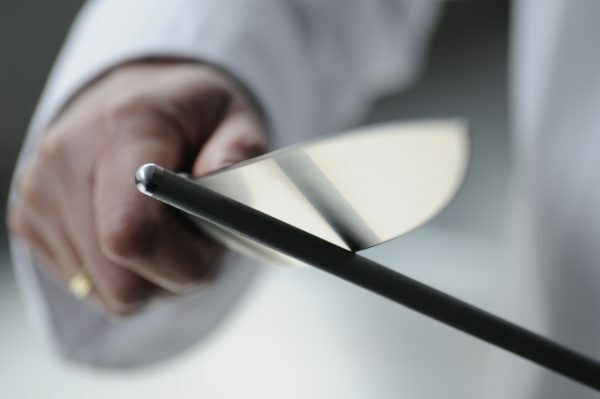 10-11 am-Hands-on Knife Skills Class- Join the professionals from Wusthof in this hands-on knife skills class. Learn the proper way to store, sharpen, hold, chop, dice, and more- as we dive deep into all things knife. Every student will receive a $10 gift card for use on your next Wusthof purchase. Class is limited to 12 people. 11:30-1:30 pm– Chef Training with Wusthof Executive Chef Mike Garaghty. The main event of the day! We are so excited to offer this professional class! This class will teach you new skills-yet delicious recipes that will have you cooking just like the pros in no time. We wanted this to be the perfect combination of knife skills (that you will really use! ), time saving ideas, money saving cuts of meat, and the perfect way to use them all for your next dinner. Each student will receive one of Wusthof’s newest knives- the 6″ curved boning knife ( a $110/value) – which is perfectly designed and sized to not only trim, debone, and cut steaks or filets but doubles as a utility knife making it a go to knife for home chefs- You will love this knife! 3:30-4:30 pm– Kids in the Kitchen- KNIFE SKILLS with Chef Lindsey Hargett- It wouldn’t be a Gygi event without a class for the kiddos! Starting them with the proper skills in the kitchen will make them love to cook! They will discover the best way to hold their knife, how to chop, and save time by doing it all correctly. Each child will leave with their own chef knife. This class is for children aged 8-13. Please make sure your child is in this age group before registering them for this class. Can’t make it to a class? Stop in anytime between 10 am and 2 pm- the whole store is having a party! We will have sales, demos, knife sharpening, and enter to win some of our favorite knives.